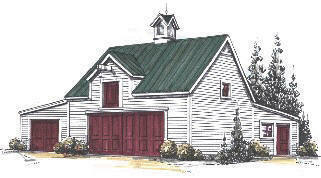 The Elm Valley Barn has three 12'x24' parking bays, stairs to a full Loft and a 12'x24' workshop at back. The shop has an 8' wide door at the other end for your lawn tractor or hobby vehicles. Floor area is 1152 sq. ft. The Loft is 576 sq. ft.